Walk to Old Salem and its shops and restaurants, Cobblestone Farmers' Market, Washington Park and the lovely, shady Strollway leading to downtown. Adjacent to Old Salem and very close to Downtown, UNCSA, BB&T Ballpark and the Wake Forest Innovation Quarter. Stylishly renovated by a UNC School of the Arts professor, this beautiful, private West Salem Craftsman style bungalow includes two bedrooms, one bathroom with spa bath and rainfall shower, and additional half bath leading off the master suite. Attractive 9 foot ceilings, a gorgeous front porch with swing and bistro table and chairs, huge back deck with 2 sun loungers, parasol, table and chairs, Weber charcoal grill, and securely fenced backyard, (rail fencing is wired to restrain even the smallest dog) perfect for those planning to bring their furry best friend along on vacation. With enough rooms to comfortably accommodate four guests, this charming house is a terrific lodging choice for business people, couples, friends, parents visiting students at one of the nearby schools or small families. The home is tastefully decorated with stunning, unusual contemporary light fittings, new windows, custom blinds, and refinished wood floors. Stainless steel appliances and birch cabinets are featured in the well appointed kitchen together with laundry facilities (stacked washer/dryer). WiFi, Smart TV (Netflix and Amazon enabled) in the Living Room and cable TV (70+ channels) in both L/R and Master bedroom are also provided. Look forward to unwinding outside on the home's lovely front porch swing, where you can enjoy the cool evening breeze. In summer lots of flowering Crape Myrtle trees line the attractive street. This rental is totally private and can be accessed via a lockbox on the front door which will hold two front door keys. The code will be provided in ample time before the guests' stay. Parking is on the right of the property as you face the house. Access to the rear deck and securely fenced backyard is via a door leading from the kitchen or they can be accessed via a gate in the fence. Walk to Granville Park, Washington Park, the YWCA, Old Salem with its shops and restaurants, and the Strollway. Short drive to downtown and grocery stores (Harris Teeter, Whole Foods, Publix, and Trader Joes). See the extensive guidebook at the house. I am originally from the UK, but have now made Winston-Salem my home where I find all the things I most enjoy: history in Old Salem (which reminds me of an English country village), the arts - great theaters, galleries, UNCSA and Reynolda House; super restaurants and bakeries catering for all tastes (some of my favorites are The Tavern in Old Salem, The West End Cafe and Mozelle's); wonderful trees and flowers and countryside; super friendly people; trips to wineries, state parks, skiing all within a couple of hours, and easy road trips further afield to the coast or other cities and states. I hope you will enjoy staying in my beautiful, sunny house ... I have tried to think of all that I would like to find in a vacation rental. I live in West Salem, and thoroughly enjoy the area, walking my dogs in Old Salem and Washington Park, making my way downtown on the lovely, shady Strollway, enjoying the arts at UNCSA, and visiting all the nearby coffee shops and restaurants. I lived in this beautiful house for a few months when I first moved to Winston-Salem and fell in love with the area being so close to Old Salem, downtown and some great parks. It is a super cute house, very stylishly renovated and has a very welcoming, comfortable vibe. I love to sit on the front porch with a book and enjoy the breeze, and in the summer the flowering crape myrtle trees are quite lovely. Half bathroom with toilet, sink and mirrored cabinet. Master bath has attractive marble tiling, refreshing rainfall shower and jacuzzi tub. Bathroom is equipped with a full range of toiletries. Gas fired convection heating, regularly serviced. Beds will be fully made with soft, fresh sheets, duvets and four pillows. Extra comforters are available in the closet in Front Bedroom. Linens/ pillows for sofa-bed are stored in the lift up chaise. Front loading eco friendly washer to be found in the kitchen. Dryer stacked on top of washer in kitchen. Off street parking for up to two cars, one behind the other, on the right side of the house as you are facing it. Free, fast wifi is available. Soft fluffy towels provided together with two robes in the master bedroom. Stove with gas hob and oven. SS microwave with extractor fan. Sufficient plates, bowls, glasses, cutlery etc for eight or more. Full range of saucepans, large ceramic coated frypan, baking tray, broiler pan, serving bowls, mugs, jug, teapot etc. Spacious, fully equipped kitchen with birch cabinets, stainless steel appliances, and cork tile floor. Dining table is extendable and will easily seat eight; chairs from the deck table can be added to those already in the dining room. Flat screen smart TVs in living room and master bedroom. Spectrum cable tv and Netflix, Prime etc. available. Selection of novels for adults, and children's books. Several issues of Our State magazine. Cambridge SoundWorks OontZ Angle 3 Next Generation Ultra Portable Wireless Bluetooth Speaker to pair with your phone and enjoy your own playlist. Great selection of children's books and board games. Securely fenced backyard with lawn. Both front and back yards are regularly mown and tidied. Should that happen while guest is in residence, no interaction will be necessary. Huge rear deck with table and chairs, sun loungers, umbrella, and a Weber charcoal grill, which will be available during the summer months. Courts available on a first come first served basis in Granville Park, two minutes on foot from house. The historic residential neighborhood of West Salem is 1.5 miles south of downtown and immediately adjacent to Old Salem. Walk to Cobblestone Farmers Market, held in Old Salem on Saturdays 9am-12 noon from April to November and buy some delicious treats to enjoy back in your cozy home. Alternatively take your dogs for a walk in beautiful Washington Park with its two large fenced dog parks or see a wonderful show at UNC School of the Arts. The house was spotless! The beds were comfy! The dogs loved the yard! We will back in 6 months for sure!!! This was a beautifully renovated home to stay in while we visited Winston-Salem to watch our college aged son play in a sports tournament. Traveling with the dog, so a VRBO home with a fenced yard beats a hotel room. Home was stocked with breakfast items, coffee, tea, snacks. Never had to go shopping. Bathroom well stocked with soap, shampoo. Whole house clean, nicely decorated. Bed and linens comfortable. Clearly a lot of thought and effort has been put into making this a nice place for folks to stay. Perfect VRBO rental. Loved the house! Patricia was most accommodating with my early arrival and had everything ready. So appreciated. Location was excellent as it was close to UNCSA as well as downtown where my daughter was working. Kitchen was well equipped and we enjoyed the complimentary goody basket. It was very comfortable and we will certainly try to stay there in the future. Comfortable, tastefully appointed and impeccably clean. This is the second of Patricia’s homes I’ve stayed in. As the first on Laurel, everything you want is here. Impeccably and tastefully decorated, spotless and clean, cozy and comfortable. Easy to get in and out and close to everything downtownand UNCSA! Just love it ! Feelmsoiked and cared for. Welcome!! The house is updated. Very clean. And she has all the small amenities you need while traveling. She is a gracious hostess who left us breakfast and a gift basket!! We will stay here again. Everything in the house new including nice sheets and towels. Thank you!!! Very close to UNCSA - and within a nice walk to many area attractions including Old Salem. The guidebook to the home and surrounding area is thorough and really helpful. We would be really happy to re-book here any time. 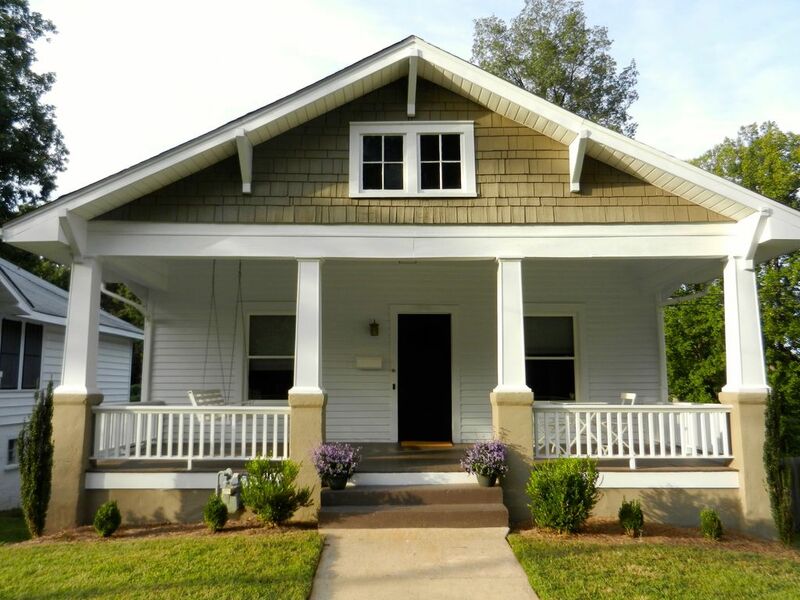 Grab a seat on that front porch swing and enjoy your visit to Winston-Salem. Walk to Old Salem and its shops and restaurants, Cobblestone Farmers' Market, Washington Park and the lovely, shady Strollway leading to downtown. Close to UNC School of the Arts which has wonderful productions at low cost (see calendar at the house), Within minutes of Caminos at Brookstown and Twin Hives coffee shops, both of which are superb. 1.5 miles from Downtown with all its great restaurants and art venues (see my welcome book), and BB&T Ballpark. Close to Wake Forest University, Reynolda House, Wake Forest Baptist Medical Center, and only a little further afield, Pilot Mountain, Hanging Rock State Park, wonderful wineries and much more.